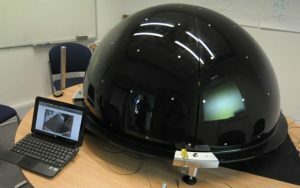 Dome1 was our first “quarters” split portable RTI imaging dome produced in the AHRC project for the Ashmolean museum in Oxford. It used 76 3W white LEDs (~400 lumen Bridgelux BXRA-N0402-00000 LEDs) driven with a constant current source. A grid cross-over technique is used to power each in turn using our custom usb controller, plus a Nikon D3x camera controlled via its USB connector. These LEDs have a “neutral white” colour temperature of around 4100K. 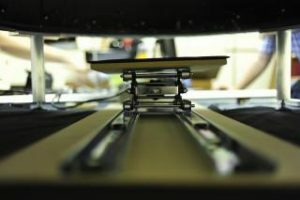 We rely on a short (< 5s) exposure to avoid heating effects and the need for a heatsink. 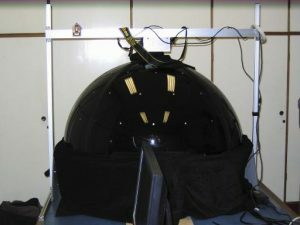 A “lab-jack” was used to raise the objects slowly into focus in the centre of the dome. This version in Oxford used sliding rails to manouvre the support in and out. 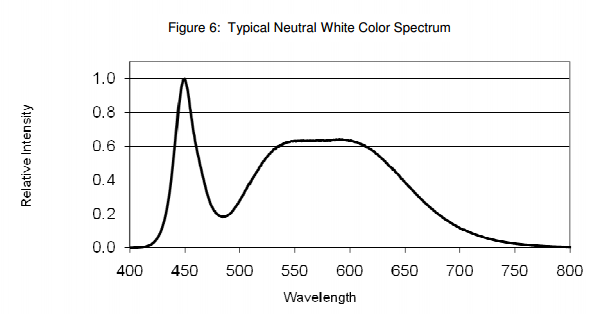 This is the spectrum of the LEDs – showing the characteristic blue spike around 450nm (taken from datasheet). You can see a time-lapse video of the dome construction on Vimeo. and a high speed lights test. Funded by the Arts and Humanities Research Council (UK) Digital Equipment and Database Enhancement for Impact (DEDEFI) scheme to develop a “Reflectance Transformation Imaging (RTI) System for Ancient Documentary Artefacts”. The project was a collaboration between Prof. Graeme Earl (Archaeology) and Prof. Kirk Martinez (ECS) of the University of Southampton, and Professor Alan Bowman and Dr Charles Crowther (CSAD) and Dr Jacob Dahl (Oriental Studies) from the University of Oxford.